Coming to Wellington from Rio in Brazil for the exhibition at the Adam Art Gallery, Fernanda Gomes works with found and constructed objects that she inserted into the built fabric of the gallery (and beyond). By weaving a poetic and aesthetic network of objects for visitors to discover, Gomes reinvigorated overlooked and prosaic materials. Her exhibition invited the viewer to contemplate an imaginary world of forms that meld material and social history, fantasy, humour and nostalgia, resulting in a highly personal experience. Gomes works with found and constructed objects that she inserts into the built fabric of the Gallery (and beyond). She is concerned with how such objects relate to their site and other nearby objects and in the ways they may speak to individual memory and imagination. Gomes has both employed architectural features of the gallery (for example, the tones created by natural light) and also intervened in the space (for instance by obstructing the natural passage down the long gallery). However, the carefully situated objects are individually as important as the overall staging of the exhibition. By weaving a poetic and aesthetic network of objects for visitors to discover, Gomes reinvigorates overlooked and prosaic materials. Her exhibition invites the viewer to contemplate an imaginary world of forms that can incorporate material and social history, fantasy, humour and nostalgia, resulting in a highly personal experience. Fernanda Gomes lives and works in Rio de Janeiro, Brazil. She has been showing internationally for over ten years. Her work has been included in the 22nd International Bienal of Sao Paulo, 1994, and the 11th Biennale of Sydney, 1998. Suzann Victor’s desire to make viewers sensitive to political and corporeal aspects of contemporary existence was evident in her large-scale installation made for the Adam Art Gallery. Expense of Spirit in A Waste of Shame is the first work by Victor, whose practice has included painting, performance and three-dimensional art, to have been seen in New Zealand. Recent large-scale works included a suspended bed overlaid with a ten-metre quilt of glass slides containing drops of donated blood (Third World Extra Virgin Dreams, 6th Havana Biennial, Cuba 1997) and enormous mechanised colonial chandeliers on a collision course with each other (Dusted by Rich Manoeuvre, Venice Biennale 2001). In Expense of Spirit in A Waste of Shame Victor placed the viewer within a dazzling, mechanised array of lights, mirrors and broken glass, reflecting glimpses of both themselves and their surroundings. This installation emphasises the processes of vision and representation that inform our understanding and identification of both self and others. As the light bulbs rub narcissistically against their own reflections, viewers were opened to a range of reactions – from seduction to anxiety. Expense of Spirit in A Waste of Shame activated both bodily and thought-provoking tensions: relating to the construction of personal identity, the way that we acknowledge others and the prospect of the effects of our own desires and actions. This fifty-year survey of collage works by German Dada artist Hannah Höch (1889 – 1978) reveals the satirical and fantastical character of her work in the medium and indicates her critical perspective on contemporary politics and the social position of women of the day. An important proponent of Dada in Berlin, Höch worked amongst a radical group of agitators who opposed the notion of common or shared artistic style. In the 1920s, at a time of rising social and political unrest in Germany, the Berlin Dadaists sought to negate the chaos of war and revolution through the rejection of dominant cultural and political values primarily those of the Weimar Republic. Höch, like her colleagues, was concerned with maintaining her individuality and freedom of opinion – concerns which are clearly born out in her art. Highlighting one woman’s extraordinary contribution to the Dada invention of photomontage, Hannah Höch: Collages demonstrates how the technique—of reassembling cut out parts to create composite images—could be employed to communicate social, political and creative concerns. Höch’s political intent and irony can be seen in images such as Heads of State (1918 – 20), in which the artist pictures two leading politicians of the Weimar Republic in bathing trunks. the assumed status of the artist as a trained specialist. Photomontage similarly had a strong propagandist force. commodified representations of women and to undermine the then current fascination in the German press with the image of the ‘new woman’–independent, employed and unorthodox. 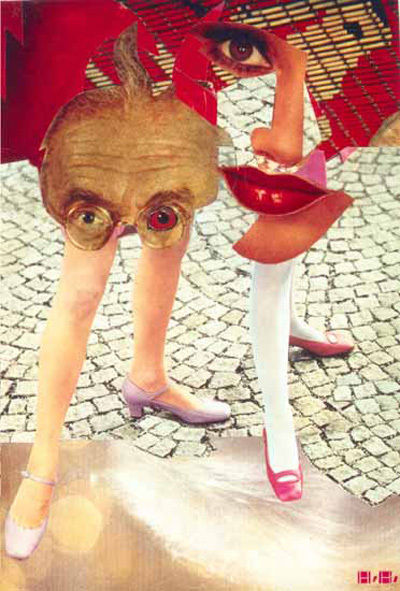 As one of the first artists to develop photomontage, Höch made full use of the technique’s capacity for subversion and satire. their forms and those of the organic environment to create landscapes, such as Light sails (1943 – 46), which were at once unexpected, enchanting and threatening. Branded a degenerate under the Nazi regime and forced to live in exile, Höch saved from confiscation not only her own works but much material from the Dada period in Berlin. Hannah Höch: Collages is testimony to Hannah Höch’s significant, yet under-recognised, involvement in Dada and reveals this artist’s individual and opinionated interpretation of the tenor of the times. Organised by the Institute of Foreign Relations (IfA) Stuttgart in association with the Goethe Institut Inter Nationes Wellington.